Just a couple of days ago I said LG are expected to bring ready-to-market 4K OLED TVs at CES 2014, and today indeed they announced they will show new 55", 65" and 77" curved 4K OLED TVs. It seems that the 77" and the 55" ones are actually the ones that they will release first as they already have a model number (77EC9800 and 55EB9600). 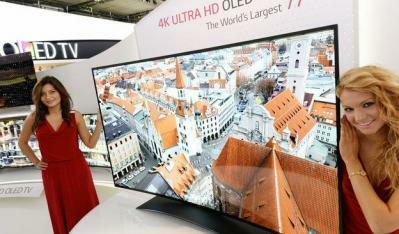 LG's OLED TVs will all be smart TVs, and will offer new image enhancement technologies. The new 55" one (the 55EB9600) will be more eco-friendly than the current 55EA9800 as it is more energy efficient and it is made from fewer component. It also uses more recycled materials. LG, by the way, will also show the flat Gallery OLED TV at CES - for the first time in the US. USA Today reports that LG thinks that 2014 will mark the beginning of a "rapid shift" to the new 4K and OLED technologies. LG estimates that global OLED TV sales will reach 30,000 to 50,000 in 2014, and they want to lead the market. This is actually a low estimate from LG. Their Gen-8 OLED fab should begin producing panels in the second half of 2014. The monthly capacity will reportedly be 26,000 subtrates - or about 150,000 55" OLED TVs. Of course yields will be lower and LG may produce some larger panels, but still it is strange that they expect only up to 50,000 OLED TV shipped (and that's together with Samsung of course). LG also says that they are preparing for the "imminent growth in demand for OLED TVs around the world". The company is establishing production bases in countries outside of Korea - they have already completed the construction of new TV plants in Brazil, Poland, China and Thailand with an advanced facility in Mexico commencing operation this year producing OLED TVs for the North American market. These facilities will only assemble the TVs as the actual OLED panel production takes place in Korea.